In August 2019 the Eurohockey Championships will return to Belgium, six years after the Euros in Boom. The brand-new accommodation at the Wilrijkse Plein in Antwerp will be turned into a true Hockey-village, where 16 European countries will battle for two European titles. It will be the epicentre for Belgian hockey fans during a 10-day hockey festival. Serge Pilet, CEO of the Royal Belgian Hockey Association was a very proud man during the press conference on Tuesday: "An event of such allure will be a promotion for hockey in general. We count on every sports fan, not only hockey players and fans, to cheer and shout our national teams to success. The stakes are big, as the European Champions are immediately qualified for the 2020 Olympics in Tokyo." The opening ceremony of the Belfius Eurohockey Championships will be held on Friday, August 16, immediately followed by the first game of the tournament played by the Belgian Red Lions. The women's final is the last game of the tournament and will be played on Sunday, August 26. At Saturday Evening (August 25) we'll know the winner in the men's tournament. And not a day goes by without a match of the Red Panthers or the Red Lions. And they could use some support, because the competition during the group stage is very tough. The Lions will play their first game against Spain and England is the second opponent. The favourites in the other group (group B) are the Netherlands and Germany. The Red Panthers have to play Spain and Germany during the group stage. 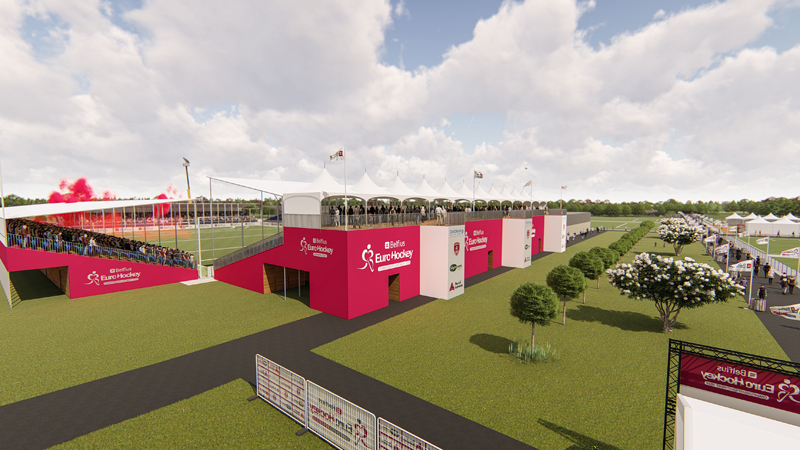 The stadium at the Wilrijkse Plein, next to Antwerp Expo, will have a capacity of 8,000 with all facilities to welcome supporters and VIP's in the best conditions. "We expect the Eurohockey Championships to be a true sports spectacle in the city of Antwerp", says Ludo Van Campenhout, Antwerp's deputy of Sports. "Organising this tournament is a wonderful opportunity for Antwerp to maintain our status as 'sports city'. In addition, hockey in Antwerp will grow as well." Competing in the women's tournament: the Belgian Red Panthers, the Netherlands, England, Germany, Spain, Ireland, Belarus and Russia.